You're Scooby-Doo chasing ghosts through a baffling maze, when suddenly you discover you're the one being chased -- by the evil skull and crossbones. Drop magic obstacles to slow the Jolly Roger's pursuit, choose from 10 pre-programmed mazes, or use the computer keyboard to create your own. System: ZX Spectrum, Commodore 64. Also available in some arcades. Scooby's friends Shaggy, Fred, Daphne and Velma have been kidnapped in an enormous castle owned by an evil genius. It's Scooby's job to travel through it and rescue them. Enemies include ghosts emerging from doors, bats which must be ducked, skulls to jump over, springy thingies, and Ghoulfish. Scooby has plenty of attacking moves, but must be stationary to launch into one. You start with six lives, and get extras by picking up Scooby Snacks, and by completing each of the four levels. Scooby, Shaggy and the gang are up to their zany tricks again! With ghosts haunting Blake's Hotel and a crazy clown running the Ha-Ha Carnival, you'll have to find all the creepy clues to solve this spooky mystery! 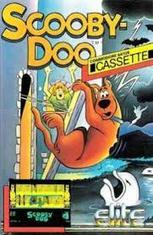 Peaked with Scooby sound effects, terrific Hanna-Barbera cartoon animations and hidden surprises, Scooby-Doo! Mystery is a scream! The gang becomes stranded by an abandoned farmhouse when their Mystery Machine breaks down. When they go in the farmhouse to get help, they find out that the residents' amusement park, Gobs O'Fun, is being haunted by a spooky phantom. The gang agrees to help them after the Gobs say they may be forced to go out of business. However, the phantom causes more chaos than expected and the gang must solve the mystery before the park is closed forever! Taking the TV episodes "What a Night for a Knight," "That's Snow Ghost," and "A Tiki Scare is No Fair," the game runs the three stories together with a unifying plotline. You play as Shaggy, trudging through haunted forests, creepy basements, and abandoned buildings with your trusty pal, Scoob. 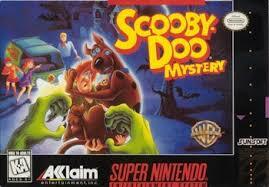 Rather than having a "death" meter, as in most games of its kind, Scooby-Doo! Classic Creep Capers has a courage meter Scoob and Shag flee the scene if they get too scared. There are plenty of clues hidden throughout the game's expansive levels, but if you're not careful the bad guys might get to you before you can solve the mysteries. ​Lost with Scooby, Shaggy, Fred, Velma and Daphne in the forests of Nova Scotia, you stumble across a medieval castle. But watch out, the place is haunted! A ghost clad in armour on a fire-breathing dragon. Jinkies! It's the Phantom of the Knight! Has he kidnapped the Princess? It's up to you to find out. ​Scooby-Doo and the gang find themselves wrapped up in a wild desert mystery when they go to Egypt to visit Velma’s cousin—only to find that she’s disappeared and a spooky old Mummy is frightening the tourists! Now, with a Mummy on the loose, it’s up to you to help Scooby-Doo, Shaggy, and the rest of the gang search through the desert sands and find the clues that will help you unwrap this world-class mystery. Uncover the mystery of the Faceless Rider! Los Burritos sounded like a great place to stop for a snack, but Scooby and the gang soon learn that the town is haunted! Help the gang search for clues, but brace yourself for challenging puzzles, wild chases, and even an outrageous pie-throwing showdown. Help those meddling kids solve a cyber mystery. Someone has beamed the Scooby gang into cyberspace with the Phantom Virus. Now, the gang must fend off a variety of villains, gather clues and find the box of Scooby snacks located on each level. Once they gather enough clues and Scooby snacks, maybe they can unmask the Phantom Virus. Can you help the Scooby gang solve the mystery? Join the Scooby gang as they try to solve the mystery of Spooky Island. Players will roam the movie locations in search of clues, solving a series of small mysteries as they work to uncover the island's ultimate mystery. Along the way the players will interact with familiar characters, explore environments based on the movie and collect items they can use to trap diabolical villains. The Mastermind has kidnapped Mystery Inc., and it's up to Scooby-Doo to search for his lost friends. 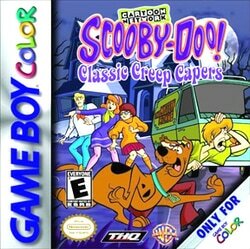 Guide Scooby through 12 huge levels that include a creepy mansion, a spooky cave, a ghostly graveyard, and a perilous pier. Help Scooby search for clues, avoid classic Scooby-Doo monsters, use wacky inventions, eat Scooby Snacks, and gather groovy power-ups. Do you have what it takes to foil the Mastermind's plan to rid the world of Mystery Inc.? Scooby-Doo: Night of 100 Frights includes 12 beautifully rendered levels within four worlds based on classic Scooby-Doo cartoons. Avoid 20 creepy monsters from the Scooby-Doo universe to solve the mystery. Power-ups unlock secret areas and bonus DVD features, giving players added replay value. The familiar celebrity voice talent includes some of the original Scooby-Doo voice actors. When a spooky Glowing Bug Man is spotted prowling the Museum of Natural History, it's up to you, Scooby-Doo, and the Mystery Inc. gang to set things straight. Are you up to the challenge? Shaggy and Scooby win a free trip to China, just in time for the Chinese New Year and the grand opening of Emperor Chu's Underground Palace. Suddenly, a stone dragon statue outside of the palace comes to life, frightening all the visitors and ruining the festivities. It's up to you and the gang to find out who is behind this scheme and crack the case of The Scary Stone Dragon! Part 3: Frights, Camera, Mystery! Grizzly Studios is being haunted by a Headless Stuntman, and you must help the gang solve the mystery. Mystery Inc. must unravel the mystery behind why mega industrialist Travis Sherman is forcing people to sell their land to him--and the role his occult-obsessed assistant Selena Jones has in these plans. Play co-operatively as Scooby Doo and Shaggy in six locations--Hambridge University, Milton Bros Movie Studio, Wild West Theme Park, Deep South Bayou, Eerie Island and Sherman Tech Headquarters--each with at least four levels, numerous cutscenes, and climactic boss levels. Arm yourself with the Tome Of Doom, a mysterious book with the power to trap and imprison ghosts, and help the other members of Mystery Inc. using the clues that brainy Velma leaves for you. Discover hidden sandwich ingredients to unlock bonuses such as art galleries, and discover hidden items to unlock Ghost Puzzle, Time Challenge and Sandwich Hunt mini games. When a pair of ghouls humiliate the gang and ruin the opening ceremony for Coolsville's Coolsonian Criminology Museum, the gang is shaken up. Do they still have what it takes to catch creepy villains after all? With their reputations on the line, it's up to you to help Scooby, Shaggy, Velma, Fred, and Daphne track down the spooky monster-making criminals from their past. Scooby and the gang are looking forward to meeting Fred's cousin, Jed. But when they arrive at the Monstrous Fright & Magic special effects company, Jed is nowhere to be found. It that wasn't enough, the company's top-secret Mubber formula, an amazing invention that allows Monstrous Fright & Magic to create the most realistic monster costumes even conceived, has also disappeared--and Jed is the prime suspect! With Mubber-fied monsters popping up all over the place, it's up to Scooby-Doo and the super-sleuths of Mystery Inc. to stop the creepy costumed creatures, unmask the truth, and prove Jed's innocence. Mystery, Inc. is facing one of its toughest cases -- and it's got less to do with ghosts than with their rivals. A new team of ghost hunters called GSI (Ghost Scene Investigators) is out there, competing with the gang. They'll have to race them to unmask a series of classic ghosts, while travelling cross-country. In Scooby-Doo! First Frights players witness the roots of Mystery Inc. as the gang unites for the first time to solves some of its first mysteries. The story picks up right where Scooby-Doo! The Mystery Begins leaves off as Scooby, Shaggy and the rest of the super-cool teen Mystery, Inc. gang explore spooky environments, solve puzzles, combat enemies and collect clues to unmask devious villains and gain prestige as world famous sleuths. With ghosts and ghouls around every corner, high school has never sounded so fun. Scooby and his friends at Mystery, Inc put their heads together to solve another puzzler. The crew is called in to investigate the appearance of a bizarre swamp girl and her caldron of mysterious brew. Help the gang solve the mystery by playing as Scooby, Shaggy, Fred, Velma, or Daphne in drop-in/drop-out play that a friend can join at any time. Search for clues in three gigantic haunted open worlds. 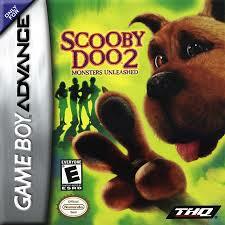 Solve puzzles, outwit enemy monsters, battle spooky bosses, and don't forget to save time for a couple Scooby Snacks. Join the mystery with Scooby and friends and leap into the zany worlds of Looney Tunes in Scooby Doo & Looney Tunes Cartoon Universe: Adventure for the Nintendo 3DS and PC platforms. Solve the mystery of Kraken Cove with Scooby, Shaggy and the rest of the Mystery Machine Gang or help Bugs and Daffy discover who is behind the dastardly defective MOCME products that are creating chaos. Solve puzzles and fight enemies as you unlock the mysteries in this exciting cartoon world come to life. Find gifts, safes and treasure chests and use the loot you collect to customize your character and empower them with special ability upgrades. When a mysterious and powerful vortex suddenly appears in various LEGO worlds, different characters from DC Comics, The Lord of the Rings and The LEGO Movie are swept away. To save their friends, Batman, Gandalf and Wyldstyle bravely jump into the vortex and quickly find themselves fighting to save all of LEGO humanity. Let creativity be the guide to a building and gaming adventure – journey through unexpected worlds and team-up with unlikely allies on the quest to defeat the evil Lord Vortech. Play with different minifigures from different worlds together in one LEGO videogame, and use each other’s vehicles and gadgets in a way never before possible. LEGO Bad Cop driving the DeLorean Time Machine…why not?! The LEGO Ninjago Masters of Spinjitsu fighting alongside Wonder Woman...yes, please! Get ready to break the rules, because the only rule with LEGO Dimensions is that there are no rules. Help Scooby and Shaggy uncover the mysteries in LEGO Dimensions, rebuild the Scooby Snack model into a Scooby Fire Snack and Scooby Ghost Snack, rebuild The Mystery Machine into a Mystery Tow & Go and Mystery Monster, activate Scooby-Doo's special Tracking, Dig, Dive and Stealth abilities, and Shaggy's tracking, illumination and stealth abilities to solve puzzles and battle enemies. You love Scooby-Doo, but have you ever wondered what it would be like to join Shaggy, Fred, Velma, and Daphne as the newest member of the Mystery Inc. Gang? Well, now’s your chance with Scooby-Doo Mystery Cases. All you have to do is open the app, and you’re in! Follow along with Scooby and his friends on their latest crime-solving adventure. You’ll find hidden objects in over 45 levels, discover new monsters, build interesting traps, and unmask creepy villains. Case closed. But it’s not all fun and games. Actually, it is. You can make the largest sandwich possible, piece together tricky puzzles to uncover clues, find objects in the dark before the flashlight batteries run out, and make sure Shaggy and Scooby-Doo don’t eat too many stinky boots. You’ll earn bonus stars throughout the games, and best of all, there’s Scooby Snacks. Want to give Shaggy and Scooby-Doo a new look? There’s a costume section for you to dress them up in silly outfits (dinosaur masks included). Plus these outfits give you gameplay bonuses like more time to complete puzzles and Scooby Snack multipliers. That’s right—more Scooby Snacks. If you need a break from all your monster-hunting fun, you can explore groovy comic books and videos, including new stop motion animated shorts. Recognize the voices in the app? They’re the same ones used in the animated series Be Cool, Scooby-Doo! This app is full of mystery-solving fun for Scooby fans of all ages. The real mystery is...why aren’t you playing it already?